Thinking about purchasing a used car? If so, protect yourself from buying a flood damaged vehicle by doing a little research and by having the vehicle thoroughly checked by a mechanic. Every year, tens of thousands of cars are damaged by floodwaters and more than half end up back on the road. Damaged cars are often repaired cosmetically and moved to adjacent states or other areas of the country where many are sold to unsuspecting consumers. These floodwaters can cause damage to a vehicle’s computer and electrical systems, as well as potentially causing anti-lock braking and airbag systems to malfunction. Check the trunk, glove compartment, the dashboard and below the seats for signs of water damage such as silt, mud or rust. Examine upholstery and carpeting closely; if it doesn’t match the interior or fits loosely, it may have been replaced. Discolored, faded or stained materials could indicate water damage. Turn the ignition key and make sure that accessory and warning lights and gauges come on and work properly. Make sure the airbag and ABS lights come on. Test lights (interior and exterior), windshield wipers, turn signals, cigarette lighter, radio, heater and air conditioner several times to make sure they work. Flex some of the wires beneath the dashboard. Wet wires will become brittle upon drying and may crack. Take a deep breath and smell for musty odors from mildew. Go to a trusted mechanic for a pre-purchase inspection. Always get vehicles checked BEFORE handing over any money. Ask to see a vehicle history report. Hurricane Floyd (1999) damaged 75,000 vehicles and than half were put back out on the road. Tropical Storm Allison (2001) – More than 95,000 vehicles flooded by the most extensive tropical storm in U.S. history. Hurricane Ivan (2004) – Left more than 100,000 cars submerged in floodwaters throughout the Southeast. Hurricane Katrina, Hurricane Rita and Hurricane Wilma (2005) – claimed more than 600,000 cars across the Gulf Coast. Many of these cars still are showing up for sale around the country. Hurricane Ike (2008) – more than 100,000 cars in Texas and Louisiana, from Galveston and Houston over to Baton Rouge, were left underwater. 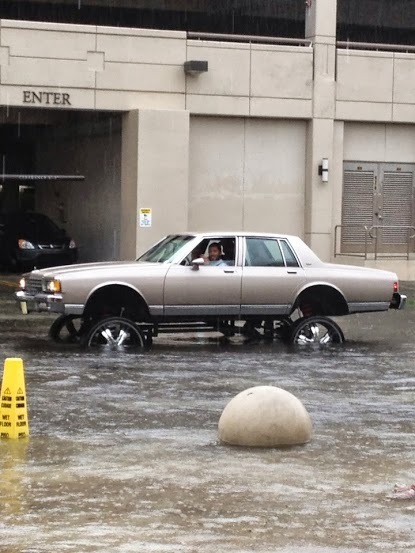 If all else fails, you can do what the dude above did and you won’t have to worry about flood damage to your car.